3d Systems is following the path we predicted when they acquired Geomagic and announced a new design tool created in cooperation with Creaform called Go!Model. The design tool fills a gap in the market for entry level scanning software. Go!Model is powerful enough to be used to clean up scans to make 3d prints. Most likely, enterprise users will still want to turn to a Rapidform package for high detail level scans. 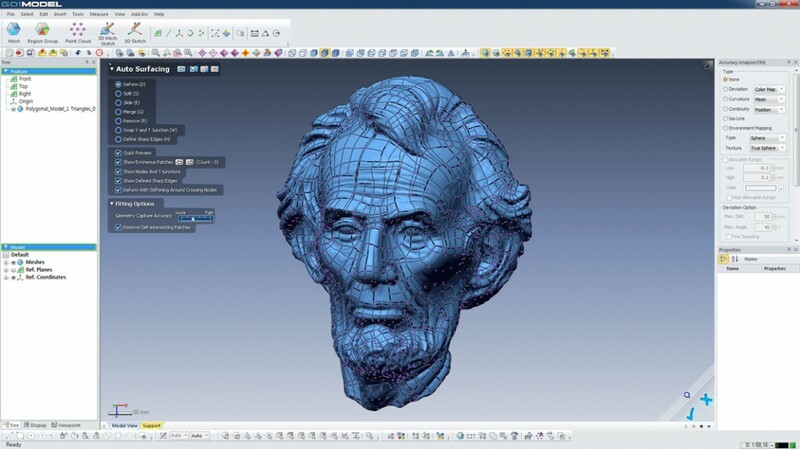 The Go!Model software is paired to the Go!SCAN 3D scanner, and can automatically generate NURBS surfaces for use in CAD/CAM software. It can also provides hole filling, shape enhancement, and smoothing to give a better 3d model for printing. You’ll have to get a custom quote, but we hear the price of the Go!Model software is likely around $5,000. So if you’re looking for a reverse engineering package that works with a Kinect or structured light 3d scanner, this might be out of your budget. The Go!Model software was a product Rapidform and Creaform were working on before Rapidform was acquired by 3d Systems. We haven’t heard many details about the management structure inside 3d Systems. Do acquired companies basically run themselves, under a Warren Buffet style model? It likely depends on the relationship of the product to the overall 3d Systems platform. That the partnership still stands shows 3d Systems is interested in continuing a teamup that clearly benefits both companies. If it goes well enough, 3d Systems may put in an offer to buy out and merge Creaform into the 3d Systems ecosystem.